A walk in the woods around Geneva Lake one September day at the turn of the 20th century forever changed the lives of Frances Kinsley Hutchinson and her husband Charles, president of the Art Institute of Chicago. Frances, a self-described “woman who never wanted a country home,” found her city resolve weakened on the autumn trek, and when the couple stumbled across a rustic “for sale” sign on the property, she found herself acquiescing to her husband — “the man who had always wanted a farm” — and agreeing to buy the land. She had no way of knowing it that day, but the 73 acres of land they purchased on the north shore of the lake east of the Narrows would become her life’s great passion: the care of a nature preserve and wildlife sanctuary that would serve the scientific community for decades to come. 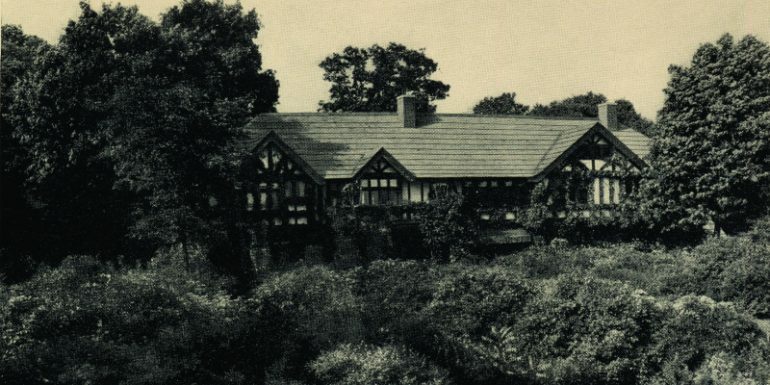 The house they built on the property, Wychwood (named for the ubiquitous witch hazel) would become an unofficial (and then official) scientific headquarters for the study of native plants and woodland animals, a passionate hobby that would consume the remainder of Frances Hutchinson’s life. A majority of the property remained mostly untouched for 50 years and became a haven for plants, trees, wildflowers, birds and animals. It became an exemplar of native conservation that the Lake Geneva Regional News described years later as the “most important wildflower preserve in the middle-west, possibly in the United States,” and the property eventually landed under the stewardship of the University of Chicago for scientific study before finally falling victim to subdivision and sale. 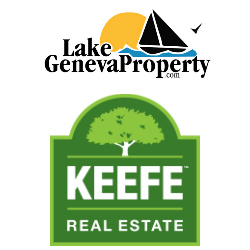 By the time they purchased 1,600 feet of lakefront land on Geneva Lake in 1900, Frances and Charles Hutchinson were well-traveled. They had been to Italy, Germany, France, Ceylon (modern-day Sri Lanka) and Japan, and along the way they quietly collected furniture and art to fill a country house, despite Frances’ initial claim that she was not interested in rural life. 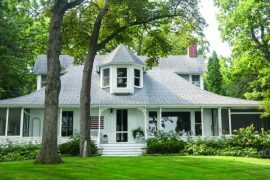 In her first book, published in 1908, Our Country Home, Frances wrote about their early days on Geneva Lake and of building and living at Wychwood. “That first September, we wandered often in the forest,” she remembered, and by November they had purchased the land and begun building a small cottage on the property as a vantage point from which to oversee the building of the big house. … The woods, the Virgin Forest, must never be disturbed, not one brown leaf should be taken from its rich covering, not one weak seedling should be denied its growth, but just as we found it, in all its natural beauty, so it should remain. However, in the process of building a mansion, certain sacrifices of nature had to be made, Frances eventually discovered. More than 400 trees were felled in order to accommodate the foundation of the house. (Frances saved many of the felled trees to use in the construction of a long pergola, about 250 feet long by 12 feet wide, leading from the house into the woods.) Another 30,000 wagonloads of soil had to be brought in to grade the lot after the trees were removed. A complex system of drainage tiles and pipes had to be installed on the property to prevent flooding and provide indoor plumbing, a relatively new luxury for country homes at the time. And they eventually discovered that a small backyard was still a necessity of the era, providing an outdoor space for many chores. But in an era when huge, manicured lawns and formal European gardens were in style, the Hutchinsons did buck the trend by keeping a majority of their 73 acres, including what would have been their front lawn, in its natural, wooded state. In addition, Coolidge designed the house to encourage interaction with the outdoors. The kitchen building was connected to the main building via a breezeway, or “dog-trot,” 24 feet long by 20 feet wide, that was screened in summer and covered in glass in the winter. The main house also boasted a large screen porch and an outdoor dining room. Almost immediately upon moving into Wychwood, Frances developed a passion for gardening. She was an avid student and a quick study, taking advantage of her husband’s connections with academic and professional experts, poring over seed catalogues and even knocking on the doors of houses in town to ask which flowers were growing in the front yard. By the time she wrote Our Country Home, she and her “well-trained English gardener” William P. Longland maintained an orchard, a cutting garden, a kitchen garden, a large classical garden and at least one greenhouse at Wychwood. She also spent hours in the woods each day, observing and recording every species of wild plant, flower and tree that she encountered. Each year the Hutchinsons spent at Wychwood brought a new opportunity to experiment with plantings. One spring, they planted 12,000 crocus bulbs in the woods only to discover that by autumn, the chipmunks had eaten all but 200 of them. They collected plants on their travels or had seeds sent to them from friends and colleagues around the world, and tried to grow them in Wisconsin to varying success: cryptomerias from Japan, osmanthus from Washington, Chinese rose-mallow. They visited local nurseries and quizzed the owners about the hardiest varietals for the harsh climate; Frances particularly admired one stubborn German immigrant who grew evergreen trees from seeds to acclimatize them properly. The Hutchinsons’ energy for planting was limitless. In just one small patch of land close to the lake where the property saw the most sun, they planted gentian, turtlehead, orchids, dogbane, bergamot, white sanicle, resin-weed, cone-flowers, sunflowers, heleniums, heliopsis, wild asters and milkweeds. But their favorite plants were the ones that simply appeared on the property, without human intervention, from seeds deposited by winds or Frances’ beloved wild birds. By 1915, Frances’ gardening knowledge was so extensive and she had become so well-known among the summer residents of the lake that she used her connections and resources to establish the Lake Geneva Garden Club, an organization which survives to this day and which just celebrated its 100th anniversary last year. Despite her initial reservations about building a country house, Frances quickly discovered she loved the rural life. She became an avid birder and documented all of the birds and woodland creatures she encountered, from the mink who made a nest in one of the drainage tiles to the many birds who nested in the eaves of the house to the flying squirrels that took up residence in her bedroom one month until she caught them and raised one in a cage to study its habits. As time went on, she became increasingly interested in attracting new birds to the property, and she and Charles began researching and planting different species of flowers in order to accomplish that goal. During their time at Wychwood, they enticed to the area and sheltered many new bird species, including hummingbirds and cardinals, both of which had recently made their Walworth County debuts. Charles Hutchinson passed away in 1924, but Frances continued to make the trip to Wychwood every summer, and continued hosting friends, family and those interested in nature and wildlife preservation. After Charles’ death, she drew up plans to ensure that the Wychwood property would remain in its natural state, and in 1926, she approached the state of Wisconsin about donating the land for educational purposes. That agreement was short-lived, however, and by 1933, Frances came to an agreement with the University of Chicago to donate Wychwood to the University. That agreement came with a generous 25-year trust to maintain the property and the continuation of a Board of Trustees which included Charles and Frances’ nephew. Frances stayed on as director of Wychwood until her death in 1936, when longtime associate director George Morse took over the position, keeping everything in the house exactly as the Hutchinsons had left it. Dr. EJ Kraus, dean of botany at the University of Chicago, appears to have been the head scientist at Wychwood, using the grounds to develop new varieties of chrysanthemums and hardy lilies better able to withstand the climate. His field lab at Wychwood attracted some of the top scientists of the era. Dr. Charles Sprague Sargent of the Arnold Arboretum in Boston and famous educator Henry Chandler Cowles of the University of Chicago both influenced the direction of Wychwood’s scientific focus, and in 1939, Eugene Aucther, one of the heads of the U.S. Department of Agriculture, spent the summer alongside Dr. Kraus studying the chrysanthemums. Frances Hutchinson left funds in the form of a 25-year trust to keep Wychwood as a center of scientific study, but when the trust ended in 1957, the University of Chicago chose to discontinue its stewardship. 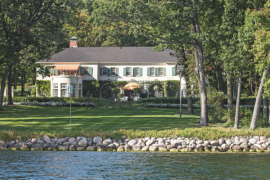 The University approached the owners of neighboring lakefront properties about selling the acreage and agreed to break up the 73-acre estate into three parcels. 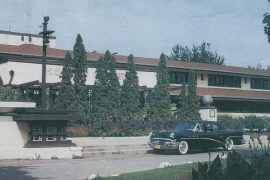 Philip K. Wrigley bought the eastern portion of the estate adjacent to his own property, George F. Getz, Jr. bought the western portion to expand his property and the center portion containing the house was purchased by Clarence B. Mitchell, son of Chicago banker and prominent lakefront owner John J. Mitchell. Reflecting the changing tastes of the age, Mitchell removed the top two floors of the large home to create a more intimate ranch house. 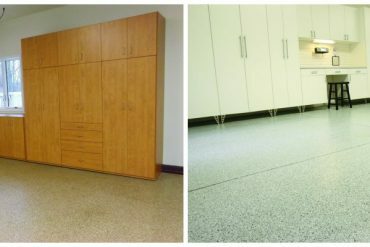 For the first time in over 50 years, the property at Wychwood was no longer an area for scientific study and experimentation. … Pause a bit … Stop and realize the joys of living. Let not the love of order keep you from the love of us. Be still, relax, lay down that learned book, that well-thumbed list, those shears and fly-whisk deft. Come sit in quiet contemplation at our feet.